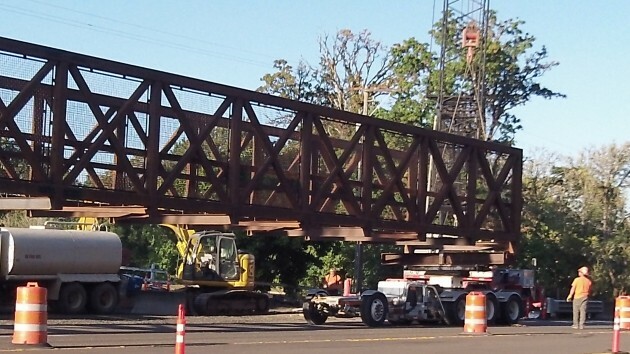 Two ODOT employees watch as the bridge is lifted onto a special truck and trailer Monday. You’d think that bridging a little creek is easy. It’s not, I realized Monday night when I watched a crew of hard-hatted construction guys get ready to use really big equipment to lift a prefabricated crossing onto a truck, roll it across Owl Creek on Highway 34, and then lower it in place just north of the highway. I got word of this operation Monday afternoon, so I rode my bike down there to take it in, down Riverside and west on 34 for about half a mile or so. Then I waited. The 130-foot span had been stored by the side of the road on the west side of he creek. Eventually, with traffic shifted away from the westbound lanes into the median, a super-long, super-low and super-heavy truck rolled into place. 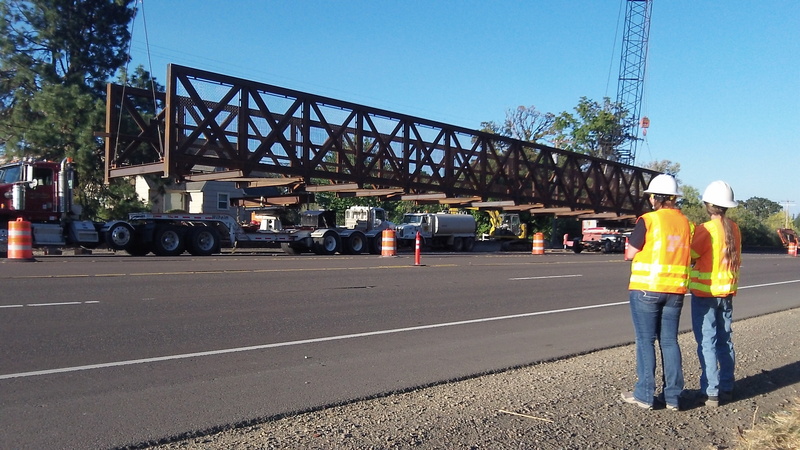 Two cranes lifted the 130-foot span by each end and lowered it on the truck and its separate trailer, which seemed to have a driver’s cab of its own. The crew was busy, and I was watching from the south side of 34, so I couldn’t ask how much the bridge weighs. But one of two ODOT employees, also watching, had asked. She told me that one of the cranes lifting it had a capacity of 90 tons. This bridge is for bikes and pedestrians and crosses Owl Creek near Colorado Lake Drive. Getting it installed is a big step in completing the new bikeway that will take riders all the way between Corvallis and Riverside Drive, a distance of about 3 miles. The $1.1 million bikeway — part of a bigger highway improvement — is a huge advance because it will separate bicyclists from freeway-speed motor traffic on 34. It’s also a crucial leg on the bike route between Corvallis and Albany via Riverside Drive and 34. Linn County has pledged to improve the seven miles of Riverside between Albany and 34 with wider shoulders for bike use. The first segment, 3 miles between Oakville and Meadow roads where the shoulders are skimpiest, is supposed to be done in 2016. The span dangles from two cranes, one on each end. Glad you made it our there. I look forward to a report of your ride after the path is complete.